Many contemporaries were unaware of Christ's incarnation on earth at the beginning of the modern era. 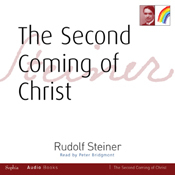 And today, says Rudolf Steiner, many remain ignorant of the most important event of our time: the appearance of Christ in the etheric - or life - realm of the earth. Fundamentalist and millennial groups await a second physical incarnation, while atheists and materialists deny spirit altogether. Nevertheless, an incisive transformation is taking place in the human soul that will lead to an emerging clairvoyance. Just as Paul perceived Christ at Damascus, so may every human being experience Him today. This audio, single CD editions, complete and unabridged, is read by respected actor and speech teacher Peter Bridgmont, author of Liberation of the Actor.